GRNP11 Klorzid Seeders Pack – Go HERE. 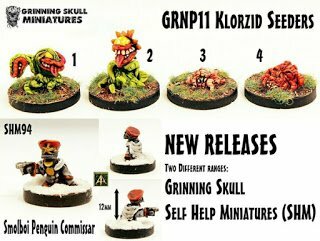 The latest new from Grinning Skull Miniatures this pack can be taken as is or select one of the four poses from it. Following up on the Klorzid Killer Plants pack there is a Two Headed Sprouter a Klorzid Sapling as well as a Nightmare Spider and a Worm Pile. Exotically odd miniatures great for many game systems. You can get the pack or singles from it from the options on the page. There are also scale shots for you to look at next to a 28mm Druidess and a 15mm SFA Trooper. Did you miss the awesome that is the Zarglians or the other Klorzids? 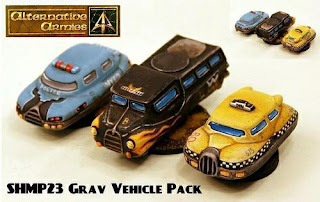 These are a real treat for your space opera or post apoc games. See the entire range HERE. 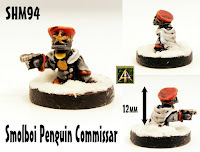 SHM94 Smolboi Penguin Commissar – Go HERE. Brand new in the Self Help Miniatures (SHM) range, which is almost at one hundred unique miniatures by aspiring designers is a great little chap sculpted by Brendon Sterma. Standing 12mm tall this Penguin is armed with a pistol and wearing a long coat and shako this commissar brings the law! There is a massive choice of unique 15mm scale miniatures in the SHM Range including the entire Star Vikings set of packs. Take a look and see all manner of aliens and more.